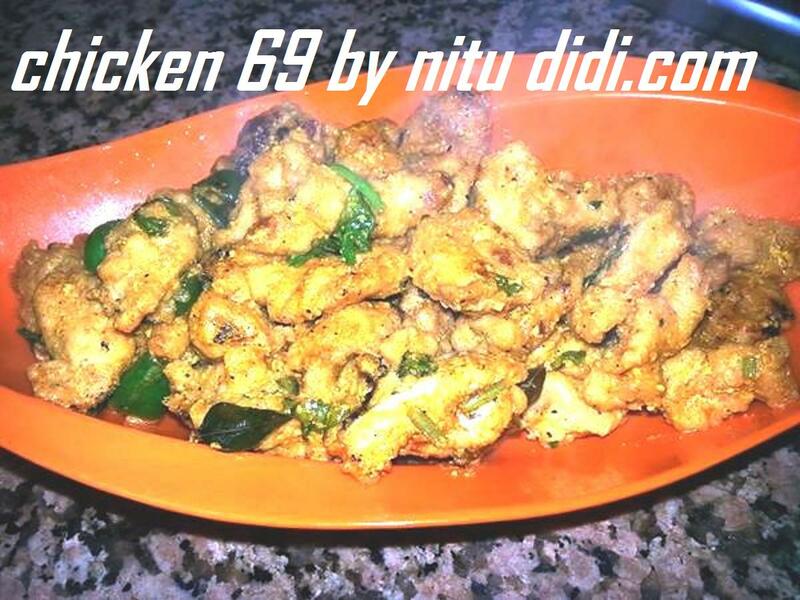 This chicken has been inspired by the famous Chicken 65 which is a popular snack all over India. I have taken that classic snack a notch further by making it gluten free and also free of all food coloring. Chicken 65 is usually a bright red in color. I also have uploaded a video on youtube of the following but made with white flour. For all you celiacs, you can now taste this wonderful dish. I know one question that will all be in your mind when you read the recipe…Can it be made without deep frying? Well, yes it can, but the taste will be NO WHERE near the real thing. I always believe that one can permit oneself a few treats…So… here is my Chicken 69! Put the chicken strips into a container and add the ginger garlic paste to it. Add some salt, and the green chilli to it if you like. Cover and marinate it overnight for best results or at least 6-8 hours. Next add to this marinated chicken the eggs and the cornstarch. Mix well. It should not look as tho it is too coated with the egg and cornstarch mixture. Heat the oil. Add the strips one by one into the oil and fry till pale golden and just about cooked. Do not brown, or else the dish wont look soo pretty!. Once all the strips have been fried its time for the next step. Mix the yogurt with some salt. red chilli powder, coriander leaves, lemon juice and turmeric powder. Add the fried chicken strips to it and mix well. Each piece of chicken should have a yogurt coating. If the mixture is too dry you can add a wee bit of water. Leave this yogurt mixture for about 2 hours. Heat about 2-3 tablespoons of oil in a big frying pan on high heat. Add the curry leaves and the green chillies. Immediately add the yogurt chicken mixture and cook on high heat till heated well. You will see the chicken has a nice glaze. Remove it from the heat and serve immediately. This method of cooking the chicken on high heat ensures that the chicken remains succulent. You can also make this with fish, tofu. paneer or even cauliflower florets. Follow the same proceedure. If you want to make this without deep frying, it wont be the same as the chicken and yogurt will go watery. The original recipe uses white flour but I tried this with cornstarch and it worked better. The chicken is lighter. This entry was posted in Chicken, Gluten Free, Indian Restaurant Dishes, Low Cost and tagged chicken, snack. Bookmark the permalink.